To reach out to the community on how to keep fit l participated in the project’ PINK OF HEALTH’ of the WASH (Women Self Help) house, where l lectured to multicultural women on how to prepare healthy and balanced meal based on the Basic Food Group to keep fit, healthy and for longeivity. With my Dietetic background l often give diet instructions to friends who seek my input in weight loss program among others. I devised a weekly diet regimen which proved to be effected to most of these friends. The diet instruction is simple i.e. to go FRUITARIAN every Monday after a weekend of FEASTING, catching-up dinners, cocktails, parties and fiestas and VEGETATIAN on Fridays. Below are my concocted recipes for HEALTHY FRUIT SMOOTHIES that can be taken twice when on FRUIT DIET. FRESH FRUITS of course are most advisable and less hassle. 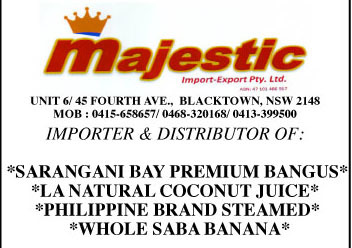 Australia is a country of bountiful fruits which are cheap when in season. These fresh fruit make good smoothies, which you can enjoy on fruit diet. You will need a blender and variety of fruits to choose from. As we all know fruits are rich in Vit A,and C which are anti-oxidants. 4. Freeze smoothies in small containers. It serves as a delicious alternative to ice cream and frozen delights. 7. Add healthy nuts to boost the nutritional value of your smoothie.